Pickwick Lake. 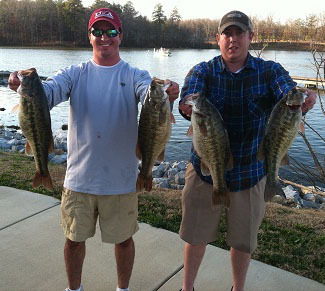 Smallmouth bass can dominate the bass tournaments held on Pickwick Lake in the summer months. However, the biggest bag of bass brought to the scales, over the course of a three day event, are not always smallmouths. Largemouth’s in the trophy weight class are not to be outdone on this tremendous bass fishery on the lower Tennessee River System. 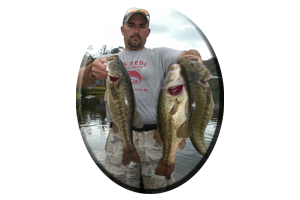 Many trophy-sized largemouth’s, some weighting in the 5-9 lb. class, are weighed in during the Bassmasters tournaments and events held by FLW Outdoors. Situated near the town of Florence, in northwestern Alabama, Pickwick Lake has survived the test of time. Summertime shows this to be an excellent fishery for a variety of bass species (and other game fish) near the lakes headwaters, situated below upper Wilson Lake dam. As below any Tennessee River impoundment dam, the huge smallmouth bass can average 5 pounds and trophy-sized smallmouths in the 7-8 lb. class are possible. 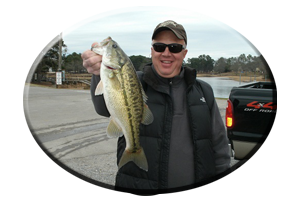 The upper end of this huge Tennessee River impoundment gets a lot of notoriety, but Pickwick lakes lower end also offers a variety of fishing situations. 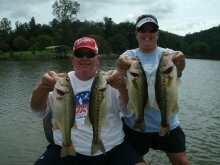 Many major feeder creeks, vast weed beds and loads of wood and rock cover, make up the mid-to-lower portions of Pickwick lake. 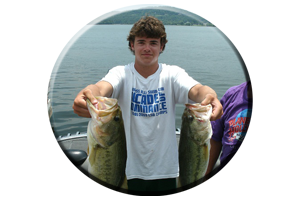 Both day and night fishing is excellent throughout the summer months on this outstanding bass fishery. When June arrives in Alabama the first hot, 90 plus degree days are very evident. Pickwick lake’s bass have fed and recuperated from the rigors of the spring spawn. Many bass are now back to “full capacity” as the main lake waters begin to warm. Main lake water temperatures will now be in the mid- to-upper 80′s. Often higher. As all species of game fish feed and follow the baitfish around their travels will bring them to a dead end at the upper lake headwaters, near Wilson Lake dam. These lake headwaters offer not only baitfish and crayfish, but also current, cooler water, and an entire area with high oxygen levels. As in most running water situations, all these bass need to do is to sit and await an easy meal. Best times for tailrace fishing is when water is being discharged or shortly after it commences. Dawn is always good for schooling bass and stripers. 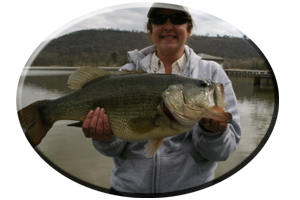 Late evening or during rare, summertime, rainy or cloudy days, smallmouth bass, largemouth bass, spotted bass, striped bass, hybrid-striped bass and white bass, can be found attacking schools of baitfish in the first 2 miles of Pickwick Lakes headwaters. Lures of all sizes, shapes, colors and actions take these voracious feeding fish of all species in the summer months. Long cast’s may be needed with many lures. Topwater lures, jigging spoons, lead tail spinners, rooster tails, crankbaits, rattletraps or Pradco’s, Rattlin’ Cordell Spots are good lure choices for fishing both day and night all summer long. Grubs, gitzits, tube baits and other shad (or crayfish) imitations, drifted in the current or cast to the schooling fish, will also take numbers of fish on-or-near the lakes bottom. Mid-to-downriver on Pickwick Lake is so spread out that an angler can feel lost when searching out summertime haunts of ever-roaming bass. Best creeks near the lake headwaters and mid-portions of Pickwick Lake that always deserve a little exploring are Spring Creek, Little Cypress Creek, Coffee Slough, Dry Creek, Sinking Creek and Little Bear Creek. * Can’t bear the heat? Night fishing is the right fishing for summer comfort on Pickwick Lake. Like most Tennessee River impoundment’s Pickwick Lake shows anglers developing an ever-increasing interest in nighttime smallmouth bass fishing. When searching out these hard-fighting, jumping bass during the nocturnal hours keep in mind (just like during the day) bass will be in or near shallow water when feeding. More than likely these bass will be even shallower after midnight. Late nights and early mornings is when most big bass cruise the shallows looking for baitfish, crayfish or an easy meal. Like your lures. At Pickwick lakes headwaters, just below Wilson dam to the bridges just downstream, lies some of the best smallmouth fishing in the south. Even during nighttime tournaments, 5 bass bags weighing 20 pounds is a common sight. There are countless numbers of 5-6 pound smallmouths weighed in each week in bass tournaments held on Pickwick lake, during both the day and at night. You can catch these kinds of bass, at all hours of the night with a variety of lures, fished in many different ways. When water is generated, as during the day, drifting with live bait can’t be beat. But challenging these bass after dark with fake offerings, takes a little knowledge of what works best on a regular basis. Chosen and proven favorites range from top to bottom and may vary. The old standby, the worm, will always take a few bass, try various shapes sizes and colors. Generally 4-6 inch models fished on light line in darker choices are best for targeting these finicky spotted bass or smallmouths. 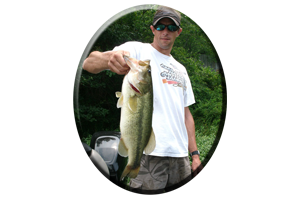 The bigger bass of these species (and some largemouth’s) prefer a full-sized meal and bigger worms may work on occasions. This goes for oversized jig and pork or plastic crayfish trailers too. Large crayfish imitations, lizards and grubs are also popular, fished on bottom at night, for all of these species of bass. Dropping or slow-rolling spinnerbaits along or near bottom is always good throughout the night. Include trailer hooks if the lake bottom is clean and hang-ups can be avoided. Short strikes are common. From mid-to-upper water column levels, bass will hit a variety of lures at night on Pickwick Lake, to many to go into detail on now. Always include jerkbaits, floating worms and various topwaters, especially after midnight, in very shallow water. * This is where the big bass feed after dark on Pickwick Lake.